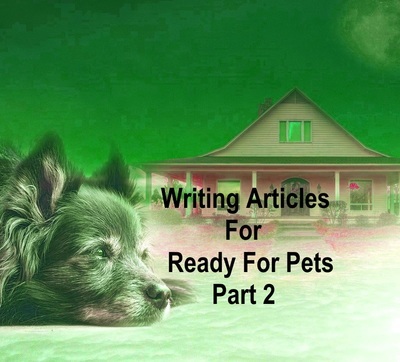 If you are a new writer for Ready For Pets and have not written for any other Hub Garden hub, please read part 1 for general instructions and links to useful articles. Now that you have read how to use the Hub Garden platform, it is time to get started with your writing. The minimum article length is 600 characters but most articles are longer. Your article can be up to 4500 characters. The number of characters is shown under the word 'update' where you edit your article. If your article is much more than 4500 words either break it up into two shorter articles or reduce the length. Basic Tips On Writing For The Web. Include at least one image, three is even better. Your image needs to be in either JPEG or GIF format. If possible use a photo you have taken yourself. Make sure it is in focus and easy to see, not in shadow. If using your own photo, put your name under the image. Read the terms and conditions of use and follow them carefully. Follow any instructions for acknowledging the photographer. If you find an image and you are unsure if it is free to use, don't use it, find another image. Tools To Help You Promote Your Articles. You can also use sites such as Stumbleupon. Add useful articles from other writers as well as your own. It may take you a long time to write your first few articles but it gets easier and quicker with time. Enjoy your writing.